It is often said that resource extraction is the “cornerstone“ of northern Canadian economies. The gritty pursuit of minerals, oil, and gas shaped a ‘frontier’ culture, and in the modern era is said to be the only way northerners—particularly indigenous people—can make a decent living, despite the environmental trade-offs. Indeed, perhaps more than elsewhere, resource development debates in the North are almost always framed as the economy versus the environment. No one has yet produced a comprehensive analysis on whether jobs, taxes, and royalties provided by resource-extraction industries really justify significant government subsidies and associated environmental liabilities. However, there are good reasons to believe that resource extraction is leaving northerners in the red—financially, socially, and environmentally. The supposed economic benefits are why our federal and territorial governments continue to subsidize northern resource extraction, despite increased awareness of toxic legacies and heightened risks from experimental technologies such as hydraulic fracturing and deep offshore drilling. A spill of toxic fracking wastewater being carried up the Mackenzie River by barge, or a single blowout from an offshore rig in the Arctic Ocean, would contaminate the wild foods that thousands of northern people subsist on. Examples of the types of subsidies being offered to resource-extraction industries in the North include: tax credits and grants for exploration; neglecting to introduce resource taxes common in other jurisdictions; publicly funded infrastructure serving existing operations or areas of high-resource potential, such as roads or hydro lines; and publicly funded marketing campaigns. While no data specific to the Canadian north is available, a 2002 study calculated direct and indirect federal subsidies to the metal-mining industry at $308.5 million per year, or $10,547 per worker. Total subsidies to the industry have been increasing, while mining employment in Canada has been declining, partly due to more capital-intensive technologies. Meanwhile, the total cost to taxpayers of cleaning up northern contaminated sites was estimated to be at least $1.6 billion, as of 2010. The largest and most costly sites are abandoned mines. As a point of comparison, the total estimated revenues from federal royalties collected on northern mines from 1966 to 2011 were $712 million, and in 2011, the Northwest Territories’ (NWT) three diamond mines paid about $49 million in local taxes. 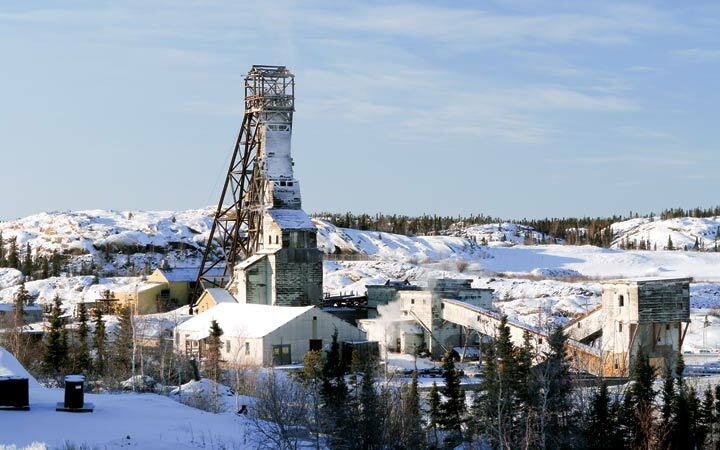 The Faro Mine in Yukon is an example of a heavily subsidized mine that ultimately resulted in a huge public liability. Low global mineral prices in the 1980s prompted the federal and territorial governments to offer grants, loan guarantees, infrastructure, and subsidized electricity to prevent the mine from closing, estimated to be worth over $800 million taxpayer dollars. After the operator declared bankruptcy in 1992, the public was left with an additional $725 million in environmental liabilities, including a four-kilometre-long toxic waste tailings pond endangering the Pelly River, and 320 million tons of waste rock that could produce acidic run-off. Abandoned mine sites are not just holdovers from the bad old-days before environmental regulation. For instance, the Jericho mine in Nunavut was illegally abandoned as recently as 2013. The federal government had to take over site maintenance to ensure waste tailings did not leak into the environment, but failed to collect a $1.6 million security deposit from the company before it fled. On the oil and gas side, while production from the three northern Canadian territories has remained quite limited, exploration has still created public environmental liabilities. For example, scientists recently found that sumps in the Beaufort Delta containing drilling waste from the 1970s and 80s are leaking into nearby lakes due to melting permafrost. Nonetheless, we are told that public investment in resource extraction is necessary to ensure people in places like Lutsel K’e or Inuvik have work. Yet, despite tens-of-millions of dollars spent by government and industry partners on training programs for northerners over the past 15 years, unemployment rates have not improved. Diamond mines in the NWT, for example, still cannot seem to meet their legally-enforceable northern and aboriginal hiring targets. In fact, jobs and profits continue to leak to the south: $306 million in wages leaked out of the NWT in 2011, with workers flown in and out every two or three weeks from as far away as the East Coast. A simple explanation is that mining or drilling is not appropriate work for everyone. Analysis has shown that rotational schedules at remote sites (involving several weeks away from home at a time) do not work well for many local people, especially those with young children. If we continue to remove publicly owned resources like minerals, oil, and gas from the ground at rates that outpace the availability of local people to take the jobs, we are stealing jobs from future generations of northerners. The resource boom and bust cycle does not come cheap, either for governments or for families who depend on a resource economy. Resource booms cause the cost of living to rise dramatically, such as housing prices and rent, and an influx of workers puts pressure on infrastructure and social services. Since the diamond mines came into operation, wage disparities have widened both in Yellowknife and in small local communities near the mines. Workers who suddenly receive very high incomes are tempted to spend beyond their means and go into debt. Yet their jobs can disappear quickly due to poor exploration results, downsizing, or early mine closures. For example, DeBeers’ Snap Lake diamond mine in the NWT let go 41 percent of its workforce between 2008 and 2009, during the global recession. Alternative economic approaches are possible in the North. A recent study found that the ‘traditional land-based economy’ in the NWT (trapping, hunting, fishing, wood harvesting, small-scale agriculture, tourism and handmade products), remains a key safety net, particularly during times of resource bust. There are now efforts to strengthen a healthy “mixed economy” where people benefit from a resource extraction economy that is done at a scale and pace appropriate for local economic development, and which also does not compromise the traditional land-based economy. The Government of the Northwest Territories has officially endorsed the idea of controlling pace and scale of development in responsible ways, but practical strategies and implementation are missing. Instead of debating the importance of the environment versus the economy, we need more research that compares actual levels of economic benefits from resource extraction to the actual costs of public subsidies and environmental liabilities. There may be a compelling case, on socio-economic grounds alone, for redirecting tax dollars towards economic sectors that keep both northerners and their land healthy. Shauna Morgan is a senior analyst in Yellowknife, Canada, for the Pembina Institute. She is engaged in community development work with First Nation communities in the Northwest Territories, with a focus on research, analytical and facilitation support for communities, in relation to proposed resource extraction projects or proposed protected areas.